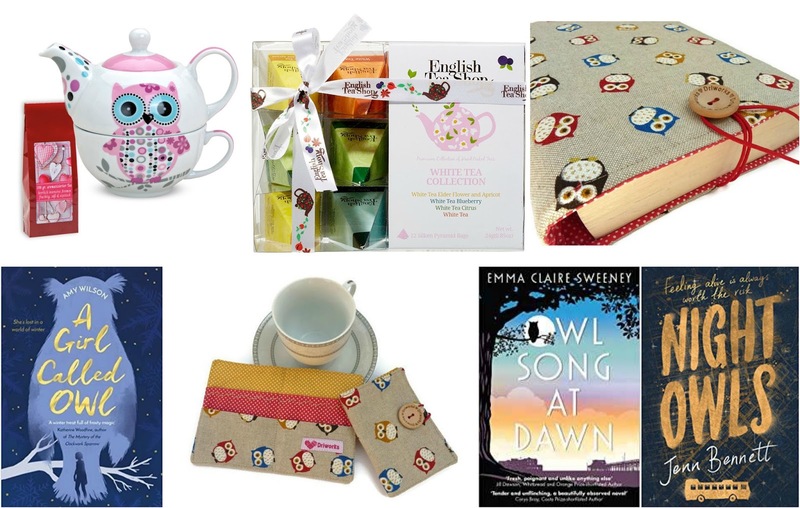 Enter this giveaway for a chance to win an owl book sleeve and matching teabag holder made by Dri Sewing, English Tea Shop tea, an owl tea for one set with tea and three Owl themed books. Good luck! I started liking owls when I read the Harry Potter series, and I simply fell in love with Hedwig and Pigwidgeon. I started getting more interested in them, they are considered symbols of wisdom and prosperity, and they're now one of my favourite birds. One of my daughters has a bit of an obsession at the moment, she's a reader too so I'd give this prize to her. I am always amazed by the way their heads swivel almost all the way around. I must admit that I prefer hummingbirds or brightly coloured ones. I enjoyed seeing 7 pelicans on the small lake just beyond our garden and they took me by surprise since this is Alberta when all is said and done. Some owls are fascinating though, the Snowy Owl or the Great Horned Owl (our provincial bird)for example. I like how majestic they look. And love the different calls they make. I love their haunting call. Very eerie. I love all birds. Owls are fascinating. They are full of character and vary in size from huge to tiny, living in old burrows underground! I love how wise and intelligent owls look. What I love about the owls is, how absolutely cute they look. No bird is ever cuter than the owl. The big round eyes, tiny beak!! I love their cuteness and how they can turn their heads! I love them because they look so wise and they are also really cute. I've liked them since i was young. My grandma collected porcelain owls and i remember falling in love with them when i went on a school trip to london zoo. Aw, that teapot is adorable! They are wise and cute too. I started to like owls when I was in Elementary school because they were our school mascot. Owls are the town mascot in the town we live in now. I love how calm and observant owls look. They don't say "wise as an owl" for nothing! They're beautiful. I like hearing them in my woods at night when I’m lying in bed. Love the way they turn their head. Quite a mystery they are. Unlike myself they are wise and have the ability to turn their heads 180 degrees, amazing eyesight and hearing...thereby making them much more sneaky when it comes to raising children. Plus they look ethereal flying in the moonlight. The eagle owl however is one scary fellow! I love how majestic they are and that they're the symbol of wisdom. I love their overall appearance - they're really fascinating, especially the range of movement in their necks! They are known to be smart. Ever since I first watched "Guardians of Ga'Hoole", I wanted to know more about every kind of owls species. My favourite are barn owls because they look so regal and fearless, plus their plumage is spectacular! I love how they glide silently into the night, you can really see why owls are so closely connected with magic. My friend is obsessed with owls, she has owl print on most things, I would love to win these for her. I love that owls in literature, from Hedwig in Harry Potter to Owl in Winnie-the-Pooh, have always been a symbol of wisdom and guidance. i just love how cute they are and the sound of thier hoot! I love how cool owls look, very wise and all knowing. They can be so quiet flying towards their prey. I love owls I think the eyes do it for me ! Becasue me daughter loves them!! They are beautiful and clever, fierce and independent. I first became interested in owls when I was in the Brownies. Our leader was Brown Owl and her deputy Tawny Owl, later replaced by snowy owl. They took us out on a day trip where we saw them an interacted with them. To this day I see them as really majestic creatures and they look amazing. They look so intelligent & sceptical! When I see owls they remind me of my Sylvanian Families. The owl family was my favourite, so owls always make me smile! I love owls because they are so cute and wise! Thanks for the awesome giveaway! They are beautiful, I love the sound they make too! I think owls are very mysterious. I had a book called owl babies when I was little and ever since then I've been obsessed! We live in a rural village, and there is a beautiful barn owl that flies with such grace at twilight - no sound - such a wonderful sight. I remember at school someone had bought in a barn owl, and it kept staring at me, and I was entranced by the sheer beauty of their huge eyes! How they can turn their heads!